What makes a place memorable? Does activity, ritual, texture, materiality, design or scale make a space memorable? Is memory the difference between dwelling and a building? Do we deflect our own memories onto a place? Is our subconscious constantly searching for relationships between what we’ve seen in the past and what we are seeing now, in the present and what we wish to see in the future? What if one could design spaces not bound by the limitations of the architectural discourse but only based on how they were remembered? Architecture gets a greater meaning due to Memory. Memory allows for a greater connection between people and place. It’s a question of place over space. It’s about substance over spectacle. Through memory this can be achieved. Memory serves as the foundation for building meaning, regardless of whether it is autobiographical or collective. Every aspect of experience becomes enveloped in the process of memory. It forms our identity as individuals together to form the identity of social groups. Memory is also the thread which links the lived-in now with the past and the future: what I remember of my past has contributed to what I am today and will play a role in defining who I grow to become in the future. The relationship between architecture and memory is forged in each one’s appropriation of the other to make connection in space and time; the fragmentation between present and past disappears, as one place, through imagery, unites with another. Memory and architecture complement one another in that they use man’s perception of imagery to recall peculiarities of place. For memory, architecture serves as a point of reference in time – a screen against which one deflects their experiences; in architecture, memory imparts the essence of form which allows the built environment to lend itself to human spatial comprehension. The study attempts to identify ways in which distinctive types of memory inform the way space is conceived and designed. It attempts to demonstrate how principles of architecture are manipulated to establish attributes and character of space. Memory is the filter through which humans experience different architectural spaces and has been used by architects to imagine and design and redesign spaces throughout history. § The idea is to question how memory may be constructed or influenced by physical space and what some of the implications may be and vice-versa. § To study how people form associations with their surrounding built environment and the role that tangible and intangible elements play in it. § To study the role of memories in the present day urbanscape where development and redevelopment at a rapid pace leads to a decay of associations. § To propose an architectural intervention that actively creates a platform where people can come and express themselves and engage their senses. § To envision a narrative structure that encourages the inhabitants to be spatially active in configuring their environment. § Sites which encapsulate several layers of memory. § Sites which function as mediators in the city, setting the stage for social interaction, exchange of cultures, identities and experiences. § Sites which allow for a multiplicity of functions and effective usage of space, thereby leading to a strong sense of ritual and association. § Sites with potential for revitalization which can contribute to overall urban regeneration of the surrounding under-developed precincts. FINAL SITE SELECTION: The Union Carbide Factory site shows a strong tangible association –comprising of rusting metal, crumbling concrete, dense overgrowth on contaminated soil, laboratories with instruments, offices with paperwork, machine rooms with warning signs, left behind as they were on the on the night of the Tragedy. What it also displays is the strongest intangible connection, where the identity of the city of Bhopal is inextricably linked to the Tragedy. After effects of the Tragedy continue to linger in the minds and bodies of the city’s inhabitants who have led a 31 year long fight for justice and recognition. The structures remaining on site are a repository of history and memories, yet, the factory lies abandoned. 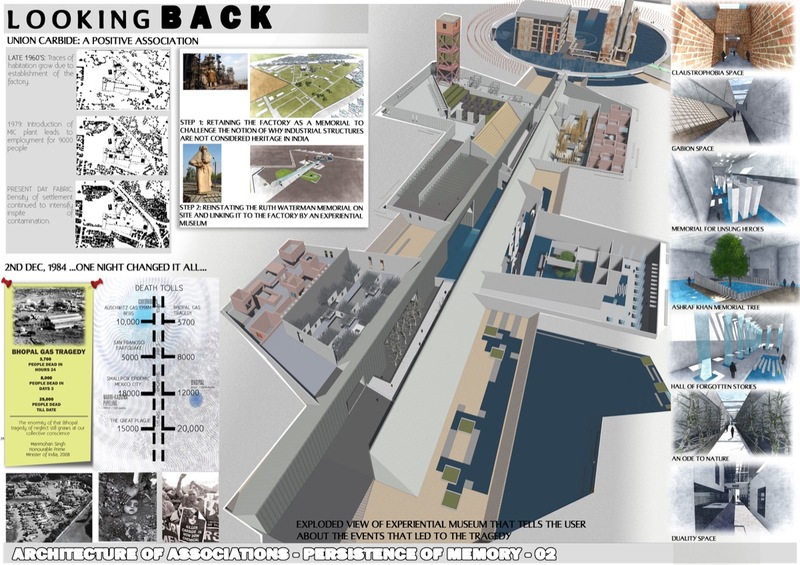 The study concentrates on the possible transformation of the site from an urban blight to an urban resource, from a site that inflicted trauma to one that evokes positive memories for the future generation. 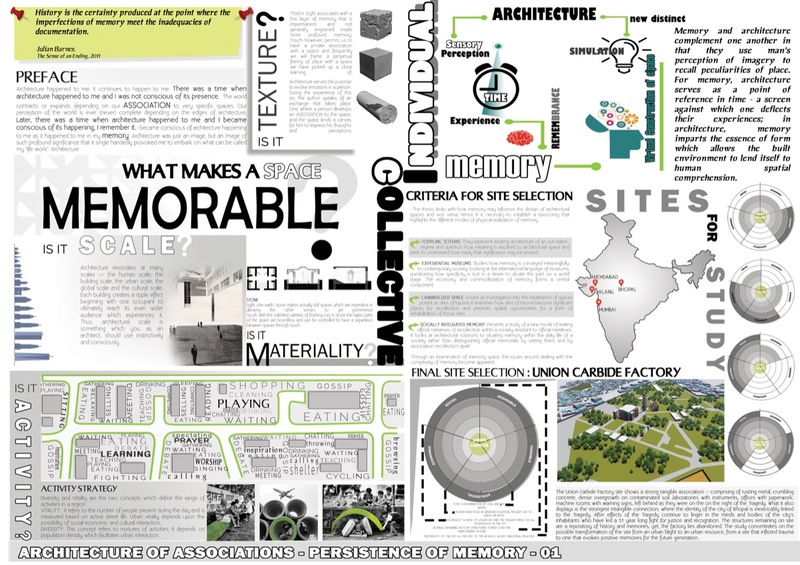 DESIGN PROPOSAL: The design proposal, symbolically and functionally, seeks to reconnect the vacant and abandoned site with the urban fabric of Bhopal and make a positive contribution to it. In the context of the Bhopal Gas tragedy, it seeks to communicate a meaningful and relevant narrative to its visitors by addressing the aspects of healing, remembrance and deterrence. 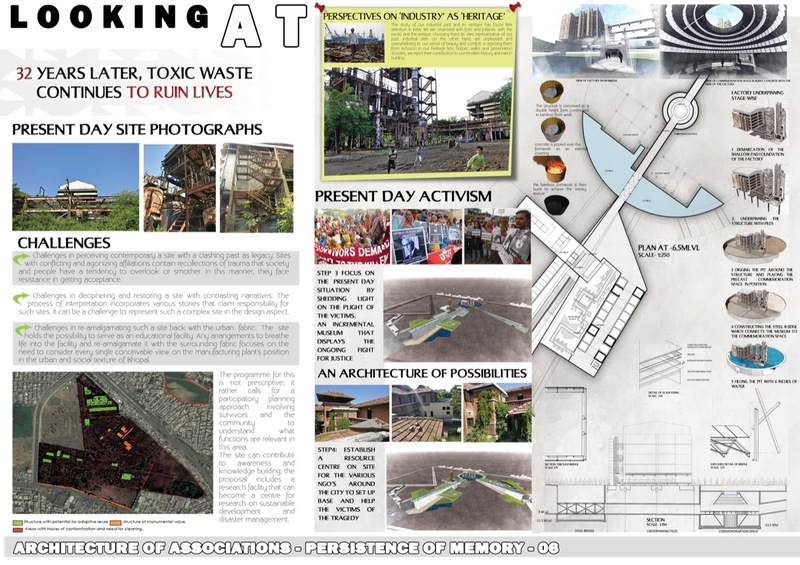 The aim is to convert the site from an urban blight to an urban resource, from a site that inflicted trauma to one that evokes positive memories for the future generation. 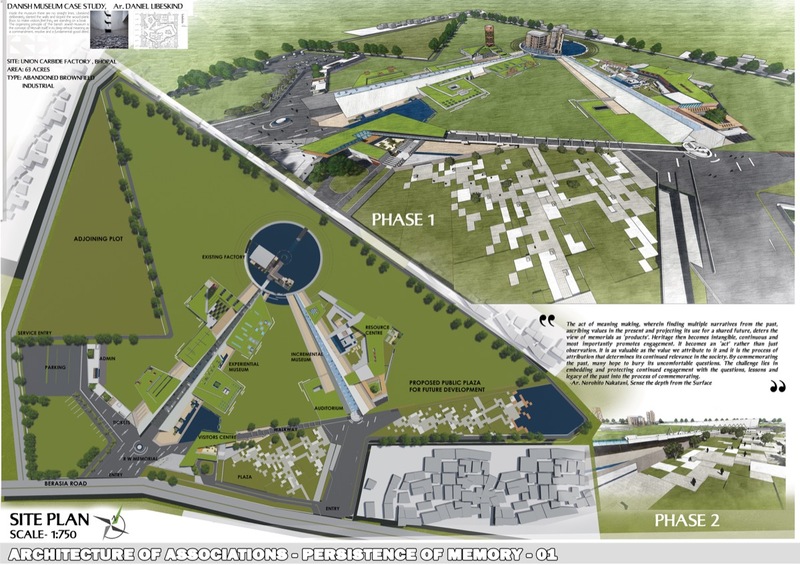 The first phase involves a memorial commemorating the Bhopal gas tragedy and its victims. 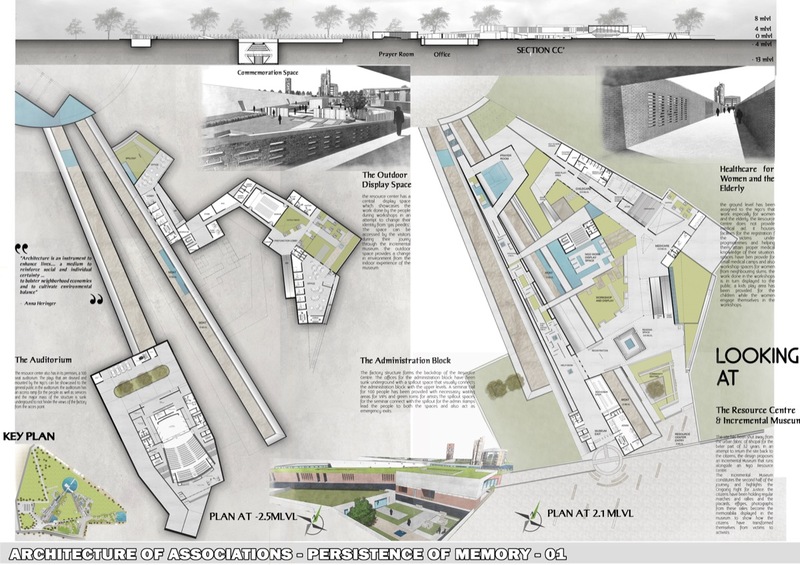 The design will identify the existing factory structures as a powerful memory of the tragedy – a painful yet integral part of the cultural heritage of Bhopal. 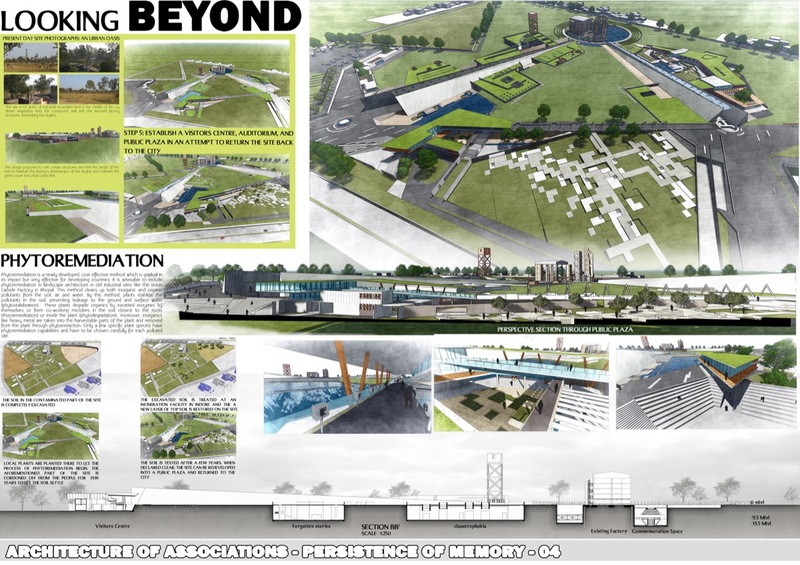 The memorial has to acknowledge the past, contribute to the present and stay relevant in the future. The site is around 66 acres of contaminated industrial brownfield land located in one of the neglected yet developing parts of Bhopal, that has been the worst affected by the tragedy. Thus, while the term ‘memorial’ conjectures for many, something smaller in scale like a sculpture, the design aims to visualize it in its urban context. 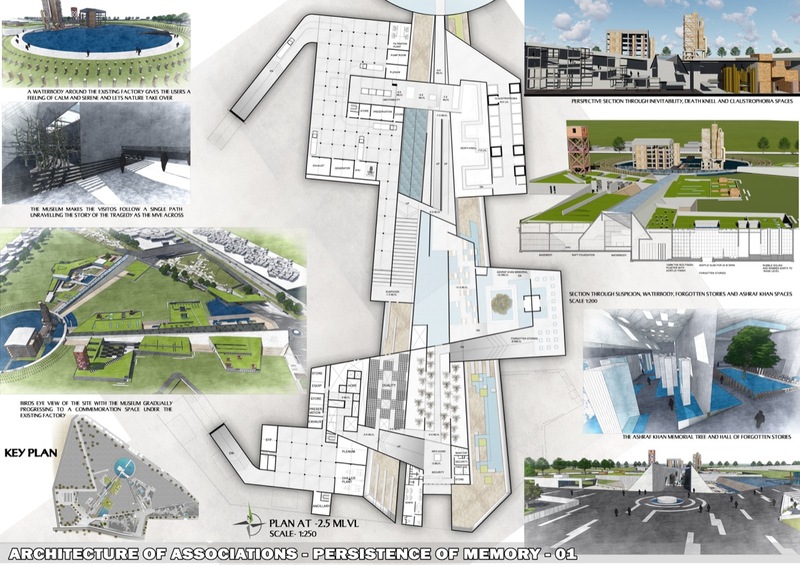 § The Urban Intervention: Reconnecting the site with the surrounding urban fabric, developing new vehicular and pedestrian linkages and establishing a visual contact with the surrounding area makes the complex a part of the visual and physical cityscape. 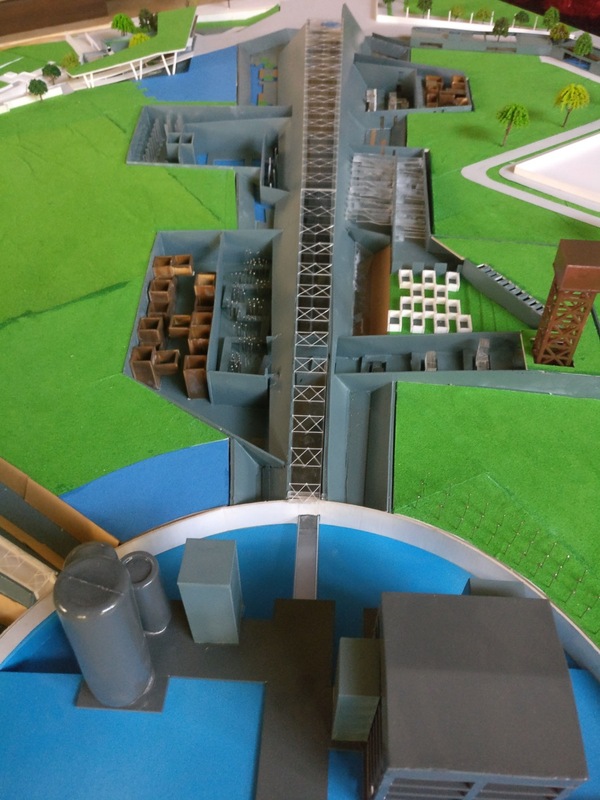 Boundaries have to be broken down to allow the site to be part of the city, while the city has to reconnect with the factory to be reminded of the tragedy. § A Resource Centre for the NGOs that tirelessly work for the recognition and treatment of the victims. The resource centre being located on the site that caused the grief to the victims is justified by the same site today being the source of their absolution. 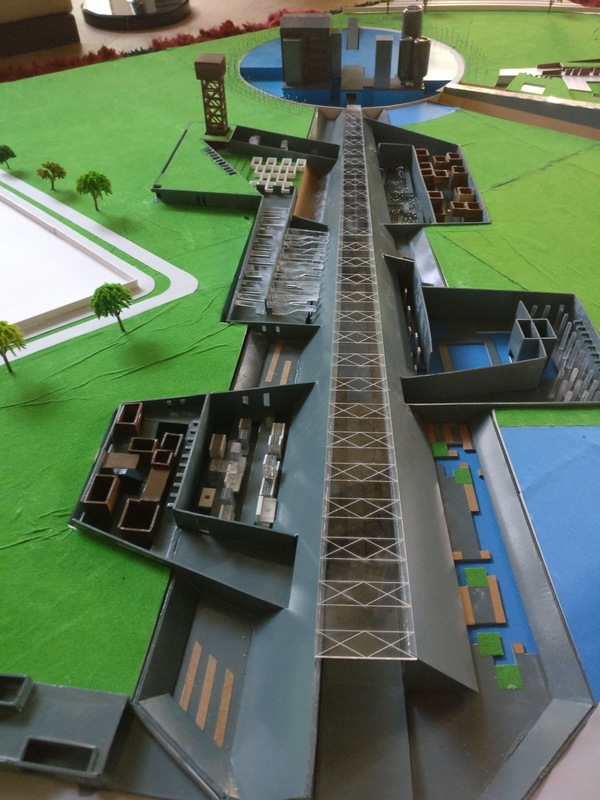 The resource centre will house offices for various NGO’s, a community centre for participatory healing, night shelters for the homeless, healing facilities. § Public spaces designed using the concept of landscape as healing. Converting the open area into a landscaped plaza pitches the power of nature as a counterpoint against the existing industrial backdrop while inviting a broader audience to the site. 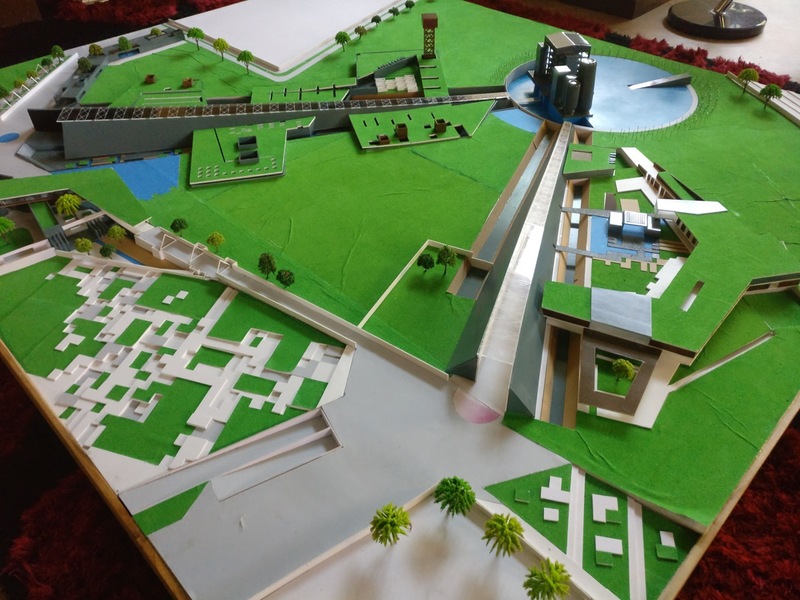 § A Visitor’s Centre for tourists and visitors to the site who wish to be educated about the site and contribute in any possible way to the Bhopal cause. The functions would be instruments that engender their own evolution guided by time and process and hence the design would materialize in phases. 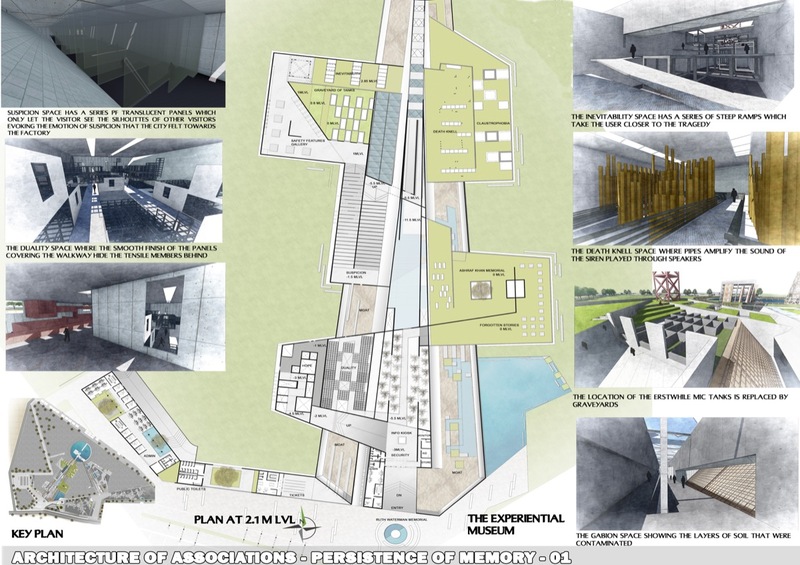 The memorial design, while being the conclusion of one process is envisioned as a catalyst and evolving point for the other functions over time. LOOKING BACK: Most people across the globe associate Bhopal with the Gas Tragedy. When the factory was set up in the 1960’s, it was considered a magnificent structure, a symbol of ‘modern’ India. It was the largest alpha napthanol plant of this design anywhere in the world. The factory produced agricultural pesticide for a ‘greener and better India’ and held great promise for a fledgling nation struggling to attain self-sufficiency in food production. The plant used hazardous chemicals like phosgene, chlorine and methyl- isocyanate that lay stocked in abundance at the site. Many smaller yet hazardous accidents and warnings prior to tragedy went unheeded. On the night of December 3, 1984, deadly gases escaped catching a city unawares, snuffing out life with silent efficiency. It is difficult to imagine the fear and desperation that would have gripped the people of Bhopal on that fateful night. It is also difficult to comprehend that in 2016, more than 31 years after the event, almost all related issues, from its causes to its fallout and its legacy remain unresolved and contentious. LOOKING AT: The site of the tragedy itself, the former Union Carbide Factory is contaminated, its structures fast disintegrating, faced with neglect and imminent destruction. Despite its semiotic cultural value as the physical site of the tragedy, the factory precinct today, already in a state of disrepair, is under constant threat of being demolished. 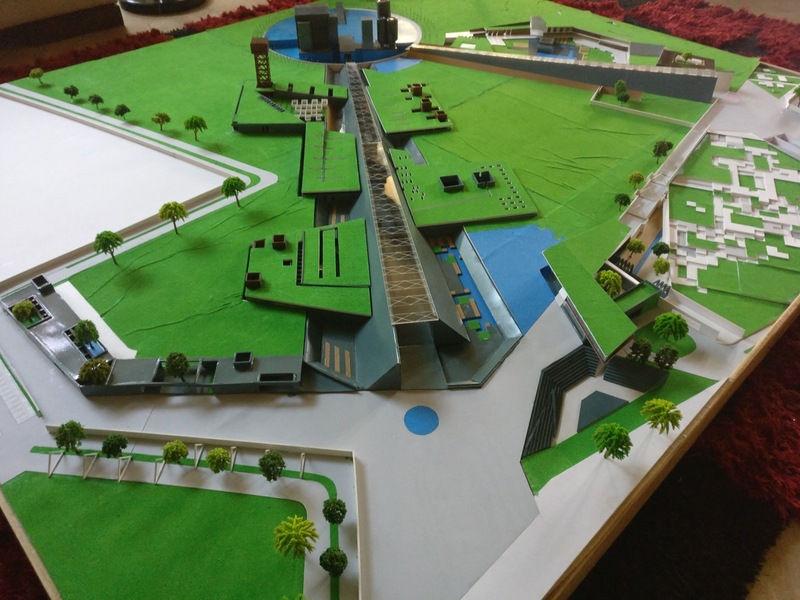 Moreover, there is no framework in place for involving and including different stakeholders in the process of commemoration to realize the latent potential of the site and transform it from an urban blight to a cultural resource for Bhopal. LOOKING BEYOND: The survivors believe that the plant structures are the physical artefact of the survivor movement to preserve the memory and lessons of the tragedy for future generations. Bhopal’s tragedy has also bequeathed the city a legacy that is of enormous significance to the global discourse on balancing development with ecology and equity. The site is a repository of history that remains undocumented and stories that are yet to be told. Whether it is to be retained, dismantled or saved in parts, a structure of its tangible and intangible importance requires significant research.